Invision is pure design. Organic materials, cool metal or mellow textiles, embedded in transparent plastic. The pre-requisite for this innovative material bonding is the special rolling technique developed by us. The numerous surface design possibilities and further processing of these top quality panels made from polyester (PETG) give you a considerable scope for your application. Different effects can be created to your liking and to fulfil your application purpose during the production of an Invision panel. Digital printing in virtually unlimited variety of colours enables to create an individual design to your projects. It is also possible to insert the multi-layer material inlays at different levels. This type of three-dimensional effect intensifies the visual depth effect. 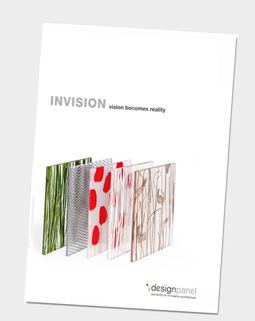 Our Invision panels are made opaque by their white laminated background. They produce a fascinating room lighting design solution when used in combination with our Lightpanels. There are numerous designs to choose from in our product range such as nature, techno or effects. Special inlays can also be used upon request. The varieties found in nature are our inspiration. All of our panels in our nature line are produced using original organic materials, so that their transient elegancy is permanently captured inside lasting plastic. Metals are the theme of this product line. Cool gloss and unusual structures give the products a futuristic touch and make them innovative components of modern interior decoration. You have a very particular idea of what your Invision panel could look like? Then make the desired elements available to us for embedding and together with us create your own personal Invision. For example, you can forge a direct reference to your company with products or materials representing your firm – ideal for advertising drives or for designing your firm’s premises. Decorative elements for creative room design are generated through the insertion of fabrics. Complete fitment concepts can be realized in this way – for example with Invision as an element in sliding doors, matched to curtains or furniture fabrics. Simply supply us with the desired fabric – and we will embed it.